Blended Learning refers to enriched, student-centered learning experiences, made possible by the harmonious integration of various strategies, achieved by combining face-to-face interaction with ICT (Oliver & Trigwell. 2005). However, these new (online) strategies are not just added on, or used to replace offline elements. 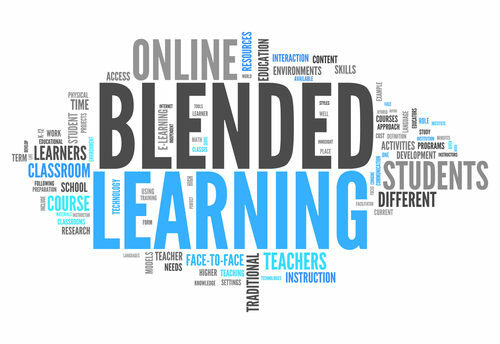 Blended Learning requires that online and offline methods are carefully selected and designed. The process of creating these experiences can be time-consuming and sometimes pose a struggle for teachers. They, for instance, need to find out which tools and strategies are available and have to develop digital skills to use ICT-tools within their education. Therefore, the Blended PBL Support team with a background in educational science and psychology offers support and advice on incorporating tools in your education. Depending on the goal, e.g. more interaction with or between your students, integrating skills like peer review or peer assessment, or co-creation and collaborative knowledge building, we focus both on the tool as well as on the instructional design within the context of your program, constructively aligning teaching and learning activities, with intended learning outcomes and assessment. Amongst other topics, we currently focus on video for education, (peer) feedback-tools, and audience response tools. But we also perform pilots in line with UM’s digital learning environment, or participate in projects on (digital) assessment and EDLAB projects. Discuss any educational question in the context of blended PBL, whether it’s about the use of online tools within your course, digital skills for you or your students or stimulate interaction with students, and much more. Tailor-made support based on your (or your teams) wishes/problems. We invite staff and students to contact us for questions regarding such topics, like trends in e-learning, improving tutorial groups with online and offline pedagogics, and the use of emerging technologies in your education. Of course, we welcome your ideas about new technologies, whether it’s online or offline, for learning and instruction! Blended teaching methods are a means to facilitate teaching or learning activities. We currently work within four main themes, providing a framework for our projects and support offer. The quadrants in the picture (e.g. interaction) refer to information on these themes. Themes describe topics or activities giving content to the theme (e.g. 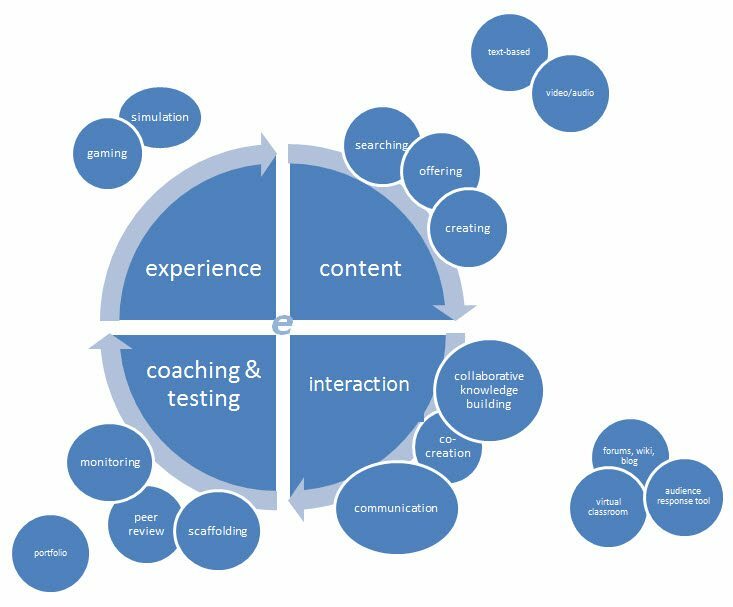 collaborative knowledge building as an example of interaction) and if applicable, we describe online and offline tools as an option serving the aimed-for activity. Our projects are connected to at least one of the themes. For every project, you can address the corresponding contact person. For general questions related to Blended teaching methods, contact us via blended-pbl@maastrichtuniversity.nl. The following means to serve as inspiration, based on current or upcoming projects or topics of interest. Interaction is seen as crucial for problem based learning. In this section we describe e-learning tools which can facilitate interaction during educational activities, like lectures and tutorial group meetings. But you can also offer (or make use of) tools to facilitate interaction e.g. in the context of collaborative learning, for example co-writing. An Audience Response Tool (ART) offers teachers and students the opportunity to communicate via polls, test questions, Word Clouds, gamification, etc. The questions are displayed on mobile devices and the answers are shown on a central screen. Using an ART, the presenter engages the audience in an interactive way with the learning activities. Increasing interaction between teachers and students can improve long-term retention of learning materials, enhance student attention and involvement, identify gaps in knowledge, and provide immediate feedback to your lecture or students present. In addition to hand raising or using microphones, audience response tools provide a way to increase interaction during lectures. student engagement; creating a safe and attractive environment for interaction in which everyone can participate. To support teachers and students with the use of an audience response tool to facilitate live voting during classroom sessions, the Library has started an official pilot with the platform Wooclap. Therefore, the Library is looking for participants to take part in the pilot. Furthermore, during the pilot phase, we also encourage teachers and students to test an alternative: Mentimeter (the free version). After the pilot phase, we will evaluate and look into upscaling campus-wide. If you want to take part in this pilot, please contact the Blended PBL Support team via blended-pbl@maastrichtuniversity.nl. After a few months, we will send you an evaluation survey. Interested in more alternatives? We described four tools (of many) in this flyer. Amongst these is also ‘Presentations’, part of the FeedbackFruits tool which also offers functionality for organizing (peer) feedback. If you are interested in piloting with FeedbackFruits, you can contact the Blended PBL Support team. or structuring the study or writing process of the individual student. Practice: Zooming in on concept mapping tools (FHML, tool available) Together with the faculty of Health, Medicine and Life sciences we experimented with several tools in order to describe them and their fit into education. As may be expected from mind mapping software, all include the same basic functionality of creating and naming relationships between elements of a certain theorem. We decided to describe four more in-depth. MindMeister (a tool available for buying). For information on making use of one of these, please consult the Blended PBL Support team. Teaming and cooperation will often be stressed and chosen as the format to have students gather and use their knowledge. EleUM offers several options to facilitate co-creation and collaborative knowledge building. The EleUM support team is constantly focusing on the functionalities EleUM offers to facilitate teaching and learning. Amongst these are wikis (ideal for collaborative writing and peer review) and blogs (e.g. suitable as a reflection tool). in the course writing a historical book review, FPN Honours students followed five sessions in order to write a review about an interesting, important and/or divergent psychology book from Maastricht University’s Special Collections. 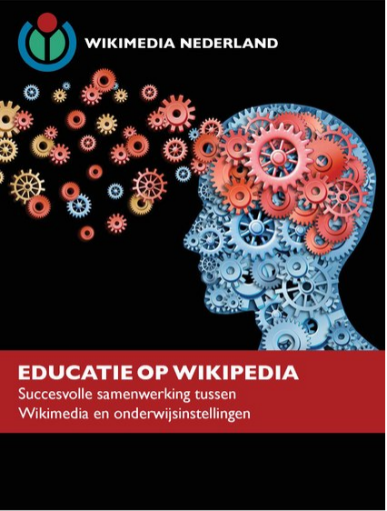 Wikimedia took care of the introduction and practical sessions, which could be provided in either Dutch or English. The UM Library provided guided tours and digitised images, which were made available by Wikimedia. in the first year curriculum of FPN as part of the Skills course, students performed the assignment writing a Wikipedia page. Students wrote – together with their peers of the mentor group – a Wikipedia page about a psychological topic. Wikimedia provided the introduction, while Wikimedia and a library information specialist collaboratively guided the practical session. Interested? On Wikipedia: Benelux Education Program/Maastricht University you can find a full list of assignments at the UM. In case you are interested in integrating a Wikipedia assignment and/or workshop into your curriculum, you can check the Wikimedia page: Education Program. If you want to know more about how the UM Library can support you in how to implement Wikipedia in your course, feel free to contact Henrieëtta Hazen via Ask your librarian. Virtual classroom PBL in Maastricht is organised around small scale group sessions or tutorial groups (consisting of 12-18 students). Once or twice a week students meet in a tutorial group meeting under the guidance of a tutor. They then discuss problem tasks and define what they need to study of perform to master the theory and make transfer happen. Sometimes physically meeting on campus is not feasible. If you do want to interact even on a distance, you can consider making use of a virtual classroom (part of EleUM). With the advent of emergent technologies, simulations and gaming can mimic reality and provide opportunities to deliver learning experiences in a realistic setting. Simulations are used in learning environments and offer a time-efficient way to reach the desired level of performance, while simultaneously increasing the performance level reached. Practice: serious gaming as a learning tool (FHML) Implementing games is done based on the assertion that thinking and learning skills can be developed by playing some adventure or role-playing games. Also at UM, the possibilities of gaming are being explored. Andreas Herrler (FHML) invested in creating a serious game to help his students actively engage with the subject. It is actually a self-assessment tool meant to improve student performance within the context of anatomy. According to Herrler, serious games “have an explicit and carefully thought-out educational purpose and are not intended to be played primarily for amusement. This does not mean that serious games are not, or should not be, entertaining.” In the Innovation project Education Innovation with IT, SURFnet has created a Testbed to enable students, lecturers and ICT & Educational Innovation programme managers to experiment with new technologies, often in the area of simulation and gaming. Tools being explored are (amongst others) smart glasses, virtual and augmented reality and 3D-video. Click here for the results of the Innovation Challenge (in Dutch only) SURF launched in 2016. Artificial Intelligence – Is there a place at UM education? A student aiming to become an academic needs to study theory or content. Often teachers provide a textbook or literature list. In PBL the student define learning issues to gain knowledge on and need to find and study learning resources themselves. Next to making use of a literature list, you can consider offering/studying e-content in your course. This can simply be a link to an e-reader, but also alternative online resources. Examples of e-content are video and animation or open educational resources. One image can be stronger than a thousand words! And videos can be a welcome addition to text books as well. The University Library offers a collection of videos and other AV resources, but the internet is also becoming a prominent supplier for higher education. Check for instance websites like http://www.youtube.com/education or http://podacademy.org/ . A specific category refers to web lectures. Higher education institutions recording (part of) their lectures are no longer an exception. To re-attend lectures on difficult topics or to be present at a distance when travelling is no option. Sometimes registrations are used for creating short clips on specific topics, to be used in other educational contexts or for other audiences. VideUM as the result of the project Video Services (finished) With the rise of new opportunities in the field of recording devices more questions arise like (what tool fits best, what does offering a video mean for my role as a teacher, which copyright issues should I take care of, etcetera. In April 2017 the library completed the video services project. Members of Maastricht University teaching staff, who would like to use video in their education, now have a one stop portal for video recording, uploading and sharing: VideUM. VideUM offers information on video production, didactics, and copyright. Here you can upload a video, find out how to register your lecture or get inspired by good practices within the UM and beyond. VideUM also serves as the gateway to UM video platform Mediasite. On this platform lecture recordings, as well as short educational videos, can be stored and shared with students. The UM library manages Mediasite, in close collaboration with faculty support staff. Follow this link for contact information of the support staff within your own faculty. Practice: Epidemiology animated (FHML) What counts for video, is also applicable for animations. Examples are Epidemiology animated, a product from a Leading in Learning project in which has been experimented with creating and offering animations for learning is the project of Bas Verhage (2012), and What is a MOOC?, a quick and simple video on MOOCs by Dave Cormier and Neal Gillis. Attractive and strong, but laborious to create. Of course you can search for commercial producers. Open educational resources (OER) or open learning materials are learning materials that are accessible to everyone under an open license. Flexible and personal education comes closer when students and teachers have access to a large and diverse collection of learning materials. The University Library follows the developments in several initiatives on making use of these OER: support teachers to use the proper (creative commons) licenses, store the materials, and help students to find and select OER. A state of the art description on Open Educational Resources is published by SURF in the 2015 Open and Online Education Trend Report by SURF On the Open Education Website, we offer examples of repositories with open educational resources, but also information on copyright issues and a tutorial to help students and teachers to find and evaluate information, accompanied with some general search tips and tricks. What we don’t want to left unspoken in this section are the MOOC’s: Massive Open Online Courses. The MOOC-list provides an overview of all upcoming MOOCs in the next thirty days. Project: UM-MOOC (finished) Maastricht University has launched (and finished) it’s first Massive Open Online Course (MOOC) in 2015 and repeated in 2017. The topic was central to our education: Problem-Based Learning (PBL). As this MOOC also follows PBL principles, working online in small groups is an important part. For more information about the UM MOOC, please consult the website: Problem-Based Learning: Principles and Design Students at the centre! What opportunities does open education offer for campus-based education? What are the potential new target groups for open and online education? What are their needs and how do education institutions address them? How can open online education be utilised to enable secure online testing? What challenges does open and online education present for learning analytics? What role can libraries play in the use of open learning resources? Tests and surveys in EleUM: everything you want to know about creating and setting up (self) tests, surveys and pools in your EleUM course. The Grade centre in EleUM is more than just a way to record students’ grades. It is a dynamic and interactive tool, allowing you to record data, calculate grades, and monitor student progress. In the Grade centre, you can provide and manage your students’ grades for assignments, tests, discussion posts, journals, blogs, and wikis, and for ungraded items, such as surveys or self-tests. You can also create grade columns for any activities or requirements you want to grade, such as special projects, participation, or attendance. Safe assignment tool (with plagiarism check). Plagiarism is the “wrongful appropriation and stealing and publication of another author‘s language, thoughts, ideas, or expressions and the representation of them as one’s own original work” (source: Wikipedia). Plagiarism is considered academic dishonesty and can result into sanctions like penalties, suspension, and even expulsion. It is important that students are made aware of what the teacher considers plagiarism. At the same time practically all papers and assignments handed in by students are automatically checked on plagiarism (if offered as a safe assignment). If a report reveals plagiarism, it is up to the teacher to decide on what consequences should be applied. which will be continued by informing UM teaching staff about those available online tools (and supporting them when implementing) that have been indicated as valuable for education by program directors. Meanwhile the UM has finished piloting FeedbackFruits as a tool for organising feedback on students (by teachers and peers, both document and non-document related) and has decided to join the national consortium with FeedbackFruits for a period of 4 years. This means that we can continue to offer tools for providing teacher feedback (e.g. on written documents) and for peer review and group member evaluation after summer, but also for other didactic scenarios like student interaction around documents, videos or presentations. how to pay attention to constructive alignment and thus optimise the coherence between curricular goals and assessment goals. Interested to learn more about digital assessment? SURF created a (Dutch) thematic page on topics related to digital assessment Do you want to stay informed on the outcomes of the pilots and the future of digital assessment at this university? Please leave your message via Ask your librarian. Trends in educational technology In close consultation with the faculties, the University Library is responsible for the Digital Learning Environment: the UM gateway to education. We offer tools and support connected to educational activities mostly used at Maastricht University. To share experiences with colleagues (and thus incorporate the latest findings when supporting you) we visit conferences and seminars where we present and learn from others. We share our impressions and lessons learned in specific blogposts as you might have read before*. * If you want to receive regular updates of the Library and Education blog posts, you can join our mailing list. We work closely with the EleUM support team and align our activities with the EDLAB, the UM institute focusing on educational innovation.